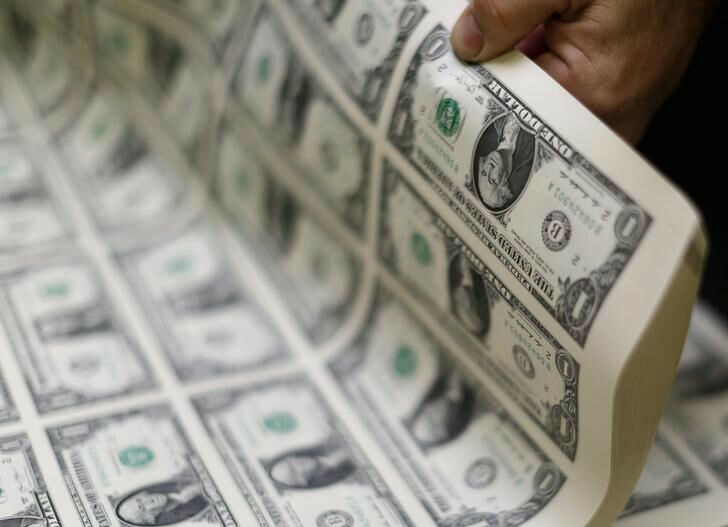 Investing.com- The dollar fell off a 11-month high in morning Asian trade on Friday, as analysts say the plunge of Philadelphia Federal Reserve’s manufacturing index prompted some traders to book profits on bullish dollar bets. The Philadelphia Fed index on U.S. Mid-Atlantic business activity fell to 19.9 in June from 34.4 in May. The Philly Fed weaker data dragged down U.S. Treasury yields, which also affected the dollar. The U.S. dollar index that tracks the greenback against six other currencies was down by 0.06% to 94.48 at 12:30AM (4:30 GMT). The looming U.S.-China trade war had underpinned support for the dollar recently. A 25 percent tariff on $34 billion Chinese goods will take effect on July 6, with $16 billion still under review. U.S. is planning to slap a 10 percent tariff on an extra $200 billion goods afterwards. This has been met with promise of retaliation from China. “If the United States introduces a so-called tariff list and adopts a method of distorting international trade and leads to unfair trade, the Chinese side has made full preparations for making a comprehensive use of various measures including quantitative tools and quality tools to respond firmly and defend the interests of the country and the people,” said China’s Ministry of Commerce spokesman Gao Feng in a media brief on Thursday. Meanwhile, the yen was little changed as the USD/JPY pair stood at 110.02, up 0.03% Friday morning. According to data released today by the Ministry of Internal Affairs and Communications, the Japanese consumer price index (CPI) that represents the nationwide cost of living was up 0.7 percent year on year in May, versus the expected 0.3%, and the core CPI also increased 0.7 percent year on year as expected. Further, The USD/CNY pair was up 0.14% to 6.5082. The People’s Bank of China (PBOC) set the reference rate at 6.4804 versus Thursday’s 6.4706. The Organization of the Petroleum Exporting Countries (OPEC) meets on Friday to decide output policy while top consumers such as the U.S. China and India call for lower oil prices and more crude production. Elsewhere, the USD/AUD pair dropped by 0.21% to 1.3526, fuelled mainly by dollar sell-off rather than Aussie buying.